Be thankful she didn’t request a palanquin for one! I thought about it, but the equipment wouldn’t fit. Haha! Yay for Hack-feels! Glad you like that last panel, I enjoyed drawing it! We have some real splash pages coming up in this chapter soon! Look how much Distance Kyle was able to pack into that 1/3rd of a page. Holy cats! Thanks, Lee! The valley you see here is called the Step. Off to the left, off panel to the North, would be where Mt Grave was. That’s Grindom in the middle, and way way way off in east you can see the Fallen Tower. I’m super intrigued about She-Dwarf wearing shoes now. Wouldn’t her halfling half want to go without them? I’m loving that last panel, BTW. I so glad hack gets to go on the quest. A weapon for every occasion I see. Well, a weapon for every occasion that dwarfs have proficiency with anyway. His super-sweat is spectacular. I can’t wait until he ugly cries. I ship it. Because Hack is adorable. Cloud won’t be happy that they stole his Buster Sword. : ( Or maybe he will be lord knows I wanted to get rid of the useless thing a few times since it was just taking up space in my inventory in ff7. 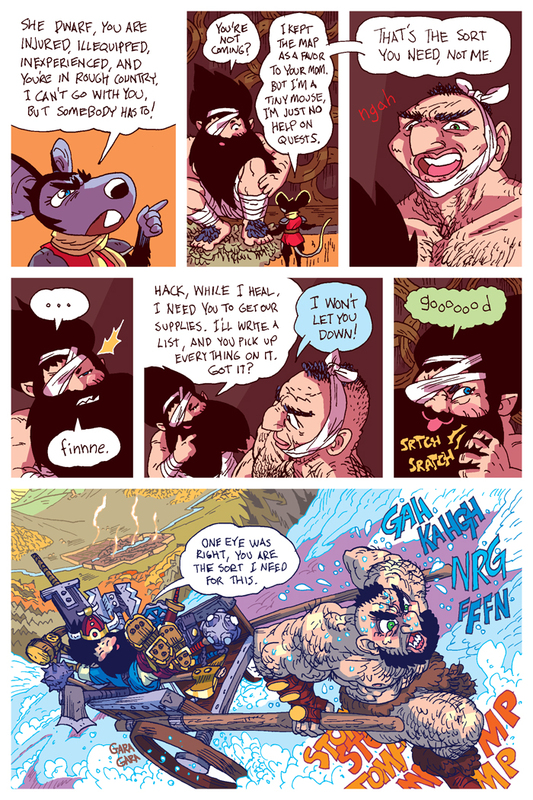 I love the way you used Hack’s beard growth and She’s lack of injuries to show the passage of time in the last panel. I just started but this is really incredible work! Thank you! Hack has been such a surprise and gift. I’m very glad Elise, my wife, asked me put him in the story more.